The Golden Mile in Durban (file photo). Durban is becoming a seaside city without any sand as strong waves pummel its beaches and the city's sand pumping efforts come to naught. Swathes of what used to be wide stretches of sand are now under water and beachside infrastructure, including a booster pump station at Dairy Beach, is being destroyed. Coastal activists and regular beach users blame the eThekwini municipality for the state of the beaches. But the municipality says it is doing all it can in the face of climate change and "overmining" of sand in the province. Johnny Vassilaros, a paddle skier who heads up the Save Vetch's Association says: "Basically it seems Durban has run out of sand. The city spent millions of rand building a new sand pumping station on the Point, which is completely dysfunctional. "It is unable to replenish the city's beaches with sand. It can only pump sand as far as Addington and is incapable of reaching the main beaches where the sand is actually needed. "In two weeks we shall be experiencing the autumn equinox tides, and if they coincide with a huge swell, there will be huge damage, perhaps even more than we had in March 2007. The reason is simply [that] there is no sand to absorb the pounding surf." Vassilaros says the city dumped millions of tons of sand at Vetch's Beach and Addington hoping littoral drift would transport the sand to the central beaches. Instead it had smothered the reef and killed off marine life. "They then attempted to dump sand directly from the dredger, but only dumped it several hundred metres offshore, which of course served no purpose. "They also tried to pump onto the beach at Snake Park by towing a long pipe out to sea and using the dredger to pump the sand onto the beach. That failed too as a huge swell arrived, smashing the 500m pipe into pieces which got washed ashore." Oceanographic and air quality specialist Lisa Guastella said she had co-authored a report in 2009 warning of the effects of a beachfront upgrade. "We warned that sand augmentation was essential to maintain the beach and should the sand pumping scheme fail for any reason, erosion was to be expected," she said. "Sadly, the sand pumping looks like it's never going to get north of Addington again owing to failed infrastructure that has never been repaired and probably never will be. And now the booster station at Dairy Beach is itself under threat. "Soon the surf spot known as New Pier will be a reef break... the Durban beachfront is highly modified and is artificial, hence it needs maintenance. "The municipality will need to decide whether to accept defeat and retreat or pay the escalating cost of defending against sea level rise." She said "what boggles the brain" is that the city just kept putting back the wooden umbrellas regularly washed away by pounding seas. Resident James Lea, a water sports enthusiast, said he had witnessed the degradation of the promenade over the years and the "wholesale lack of ongoing preventative maintenance". The city concedes there is a problem. Communications head Tozi Mthethwa said the city had employed several strategies to combat the effects of climate change and overmining of sand. "These include ensuring that beach sand washed out by the currents is swept back by municipal employees on a daily basis. "The municipality has also written to the national Department of Mineral Resources to request a meeting aimed at tightening regulations on the issuing of sand-mining permits. More law enforcement officers will also be appointed and deployed at various areas along the coastline to ensure that the sand mining regulations are adhered to." She said the sand pumping operation - which was critical - was a joint exercise with Transnet and was done using the company's dredger, which the city did not have exclusive use of. 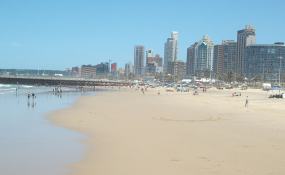 "The annual volume of sand that is required to maintain Durban's beaches is approximately 250 000m 3 , and annually we have been able to pump approximately 500 000m 3 from Transnet. "We replenished 100 000m 3 to 250 000m 3 up to Addington Beach using the main diameter pipe. Transnet's dredger has been pumping directly onto our beachfront, however we can only pump until Addington Beach. "We are awaiting the construction of the Transnet hopper station which will help us with the sand. The dredger will fill the station and we will have a much more consistent sand supply." Mthethwa said: "We are also aware of the forthcoming high tides. Measures have been put in place to protect our infrastructure and to warn the public ahead of beach closures. All our officials are on high alert."